One of the few features of Samsung’s TouchWiz that people seem to actually like is the multi-window support (pictured below). This has evolved quite a lot over time, with every new flagship made by the Korean company. It’s now a pretty mature system, in fact. But what if you like Android the way Google envisions it? Well, up until now there’s been no such feature in ‘vanilla’ Android, but that state of things may change soon. 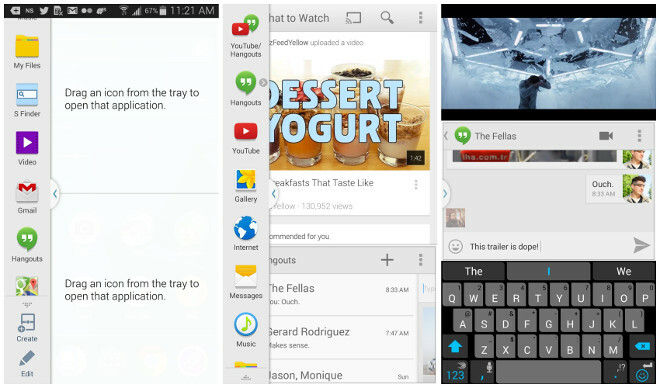 Google is apparently working on integrating multi-window support in Android itself. This might see the light of day with the next major release of the company’s mobile OS. We could hear something about it at the Google I/O developer conference in May, as that’s usually where Google unveils big new Android features. The revelation that Google is developing something like this comes from a framework code commit in AOSP (the Android open source project). This clearly references “multiwindows”, though there aren’t many details to go on. One particular feature has been disabled in the code for now, and it’s supposed to get “reenabled for multiwindows”. It’s unclear how exactly Google will go about implementing this functionality, and how similar it will be to Samsung’s manner of doing things, but it sure looks like multitasking on Android is about to get better in the future.